So you want to begin fly fishing. Well, welcome you to the club. Perhaps you have been spurred on by a fly fishing enthusiast in your family - probably an uncle, bet - or maybe you saw a fly fishing documentary and are now interested in giving it a go. Maybe You're Even An Experienced Fisherman Who Would Like To Give This New Technique Of Casting A Line A Try. Whatever The Reason May Be, Fly Fishing Is A Great Way To Be Outdoors And To Enjoy The Elements In The Same That Our Ancestors Have Been Doing For Thousands Of Years Before Us. When I First Started Fly Fishing, I Figured That The Most Important Thing To Do Was To Get The Right Equipment. Spend Hours On The Internet Researching Fastidiously, Burnt A Large Fish-Shaped Hole Into My Pocket And Then Found Myself Standing Ankle-Deep In Murky Waters Wondering: Well, What Now. 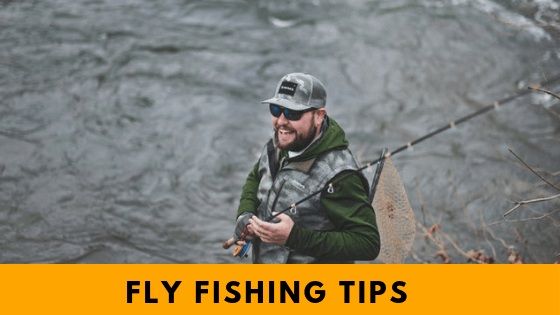 So, In The Hopes Of Providing A Little Illumination Along The Way, Here Are Some Fly Fishing Tips That Will Make Your Transition As A Greenhorn Into This Fantastic Sport Much Smoother. Before You Run To The Nearest Fishing Store And Spend Your Entire Life Savings On The Best Equipment Money Can Buy - Practice Your Casting. Yes, You Can Look Up Casting Techniques In Magazines, On YouTube Or Even By Watching Other People Cast Their Lines. However, The Most Effective Way For You To Learn The Correct Manner Of Casting Is To Work With An Angling Instructor. By Doing So, You Will Be Learning The Right Method Of Casting From The Get-Go. Casting Is The Bread And Butter Of This Sport. Without It, You Cannot Hope To Catch The Big Game Fish. Hundreds Of People Who Have Been Fly Fishing For Years - Sometimes Decades - Find Themselves Handicapped By Their Inability To Cast Effectively. Don't Believe Me? Just Ask Stevie Munn. Once The Movement Of Aligning The Bait And Casting The Line Has Become Second Nature, You Will Be Able To Focus Online Control - The Delicate Art Of Coordinating Line Movement Between Your Stripping And Rod Hand. When People Start Fly Fishing In The Beginning, They May Automatically Assume That Like Any Other Sport, Fly Fishing Can Happen At Any Time Of Day. If You Want To Avoid Baking By The Riverbanks In The Sun And Tugging On Your Lines To Ensure That They're Still Connected Or Wondering Why Your Rod Tip Is Entirely Static And Un moving - Then Go At The Right Time. Show Up To The Riverbanks At Around 4 Pm, Take A Seat And Watch The Fish Come Out To Play. In The Late Morning And Afternoons, The Heat From The Sun Makes The Sand-bed Warm. This, In Turn, Causes The Fish Sleepy And Lethargic. Come Sunset Though; They Tend To Be Re-Invigorated. This Is A Tip That Fly Fisherman Pick Up On After Weeks And Months Of Trial And Error. However, If You Want To Keep That Fly Fishing Fire Inside You Burning Bright, Then Turning Up At The Right Time Will Increase Your Chances Of Catching Fish And Keep You Motivated. This Is Probably The Most Overlooked Skill Among Fly Fisherman. Jumping Into River Waters So Quickly After Learning To Cast Can Sometimes Result In Accidents. Riverbeds Are Lined With Slippery Rocks And Covered In Loose Mud. You Can't See It Clearly, But It's More Than A Jungle Out There. Not Knowing The Proper Way To Navigate These Waters May Not Only Cost You The Catch Of Your Life But It Could Lead To An Ugly, Highly Unnecessary Visit To The Hospital. Many Tools Fly Fishers Can Use To Keep Them Steady In The River. Start With Your Feet - Get Felt Soles. These Will Give You A Firm Grip On The Slimy Rocks. Though Felt Is Often Quickly Ruined By Water, It Is Easy And Cheap To Replace. If You Lack The Financial Resources To Invest In Other Wading Equipment, Be Sure To Spend In Felt Soles. Your Feet And Legs Will Thank You For It. Instead Of Having Just Two Points Of Balance - Your Feet - Go For Three. Use A Wading Stick. A Wading Stick Gives You A Firmer Base Of Support And More Importantly, It Will Lower Anxiety Levels That You May Face When Wading In Particularly Difficult Areas. Remember That You Are Catching Fish. Fish Scare Easy. So Moving Slowly Is Not A Problem. The Type Of Movement You Employ Is Also Highly Critical. Walking A Usually May Be Possible If The Level Of Water Is Less Than Knee-High. Once It Gets To That Level, However, Walking Sideways Is The Best Option. Walking Sideways Means That Your One Foot Firmly On The Ground Anchoring You Down While The Other One Looks For A Foothold. The Idea Is Simple; The Anchor Footholds You In Place And The Roaming Foot Doesn't Commit To A Location Until It Finds A Place Where It Is Safe. Wading Is All About Safety And Slow, Measured Movements. Staying As Dry As You Can In Icy Waters Is Essential For Obvious Reasons. Lousy Wading Techniques Are The Quickest Way To Have All The Fish Around You Swimming In The Opposite Direction At Lightning Speeds. Fly Fishing Is A Great Sport That Reconnects You With Nature Easily. I Hope This List Has Not Only Entertained You Somewhat But Also Given You A Peek Into What Is Of Absolute Importance. These Are Tips That I Wish Someone Had Informed Me Of When I Began. Though That Courtesy Wasn't Extended To Me, I Am More Than Happy To Pass On The Little Knowledge I Have Gleaned. Following List Is A Great Way For You To Work On The Basics. Fly Fishing Is Like Every Other Area Of Life Practice Makes Perfect. However, Practicing The Basics Is The Best Key. Without Them, Your Dreams And Hopes Of Catching Big Game Fish Will Be Akin To An Unskilled Wader Falling On His Behind In Muddy Waters Because He Refused To Wear Felt Soles. If You Have More Fly Fishing Tips Of Any Kind To Offer, Leave A Comment Below. Also If You Found This List Helpful In Any Way, Let Us Know! Your Encouragement Could Lead To Many More Great Tips In The Future.